Brian Raftopoulos, University of the Free StateRobert Mugabe’s name is synonymous with both Zimbabwe’s liberation struggle and its post-colonial politics. His role and that of his Zanu-PF party have been central to the country’s dynamics since the early 1960s – and could well set the tone for the foreseeable future. 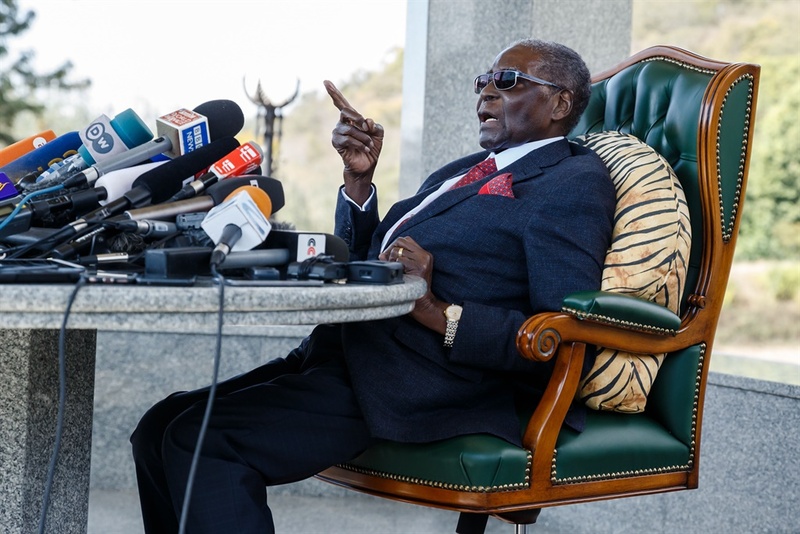 For much of his political life Mugabe has often been viewed, in the words of one of his biographers Martin Meredith, as “secretive and solitary”, an “aloof and austere figure”. However he is described, there’s no doubt that Mugabe’s political legacy is highly contested. To understand how this happened, it’s necessary to examine his personal history; his political demisein 2017; and Zimbabwe’s deepening political and economic crisis more than a year after Mugabe’s ouster. For the faction that has succeeded Mugabe, led by President Emmerson Mnangagawa, moving beyond the highly problematic legacy that they helped to create remains a daunting task. Robert Mugabe was born 94 years ago at Kutama Mission in Zvimba District, west of what was then called Salisbury, the capital of then Southern Rhodesia (today’s Zimbabwe). He received a Jesuit education and was by many accounts an exceptional student. In 1945 Mugabe left Kutama Mission with a teaching diploma. He won a scholarship to South Africa’s Fort Hare University in 1949. There he met other emerging nationalists and was introduced to Marxist ideas. Armed with a BA degree in history and English Literature, Mugabe returned to Southern Rhodesia in 1952. He soon moved to the Northern Rhodesia (today’s Zambia) in 1955 to take up a teaching post. In 1958 he moved again, to a teacher training college in Ghana. There, a year after Ghana’s independence in 1957, he experienced the thrill and sense of possibility of a newly independent African state. It was a seminal political moment for him. Mugabe returned home in 1960 on extended leave to introduce his new wife Sally Hayfron to his family. Instead of returning to Ghana, he became entangled in nationalist politics. This included the turmoil that the two major nationalist parties, Zimbabwe African People’s Union (Zapu) and Zimbabwe African National Union (Zanu), split. In 1963 he was arrested, along with many other nationalists. He was released after 11 years. Mugabe and his colleague Edgar Tekere escaped to Mozambique in 1974 to join the liberation war against the regime of Prime Minister Ian Smith, conducted from bases in that country. There have been different accounts of Mugabe’s rise to the top of the leadership in Mozambique. As liberation war veteran Wilfred Mhanda tells it, their support for Mugabe was premised on his commitment to building unity between the rival nationalist movements. But he reneged on this, instead pursuing the supremacy of his own party Zanu. Following the Lancaster House settlement and the 1980 elections, Mugabe’s Zanu emerged as the dominant party. He set out his policy of reconciliation with the white population. This allowed the existing property and economic relations from the Rhodesian period to continue, while the politics of state control was transferred to Zanu. This period witnessed the consolidation of Mugabe’s control of both his party and the state. The massive violence committed against the competing party of liberation, Zapu, through the Gukurahundi massacres, signalled Zanu’s violent intolerance of opposition. However, the 1980s were also evidence of Mugabe’s commitment to social policies such as health and education. Mugabe’s government greatly expanded the state expenditure in these areas in the first decade of independence. The hostilities between Zapu, led by Joshua Nkomo, and Mugabe’s Zanu officially ended with the signing of a Unity Accord by the two leaders on December 22, 1987. Zapu was effectively swallowed by Zanu PF. The ruling party had used the acronym since the end of the brief Patriotic Front coalition (1976-79) between the two liberation parties, on the eve of the 1980 elections. During the 1990s, opposition to Mugabe grew in size and influence. Faced with the real possibility of political defeat – and dissent from the war veterans – Mugabe drew on longstanding land grievances to reconfigure the politics of the state and Zanu-PF. His Fast Track Resettlement programme radically reconstructed the land relations from the settler colonial period. There is a continuing debate about the effects of the land redistribution exercise. It resulted in the violent allocation of land to a combination of large numbers of small farmers and the ruling party elite, and its long term impact on the country’s economy remains problematic. The process also created a massive rupture between human and redistributive rights . By legitimising the Fast Track programme, Zanu-PF emphasised economic redistribution and settling the colonial legacy around the land question. But in doing so, the ruling party opportunistically labelled the fight for human and democratic political rights – which had long been central to the anti-colonial struggle – as a foreign “regime change agenda” pushed by the opposition Movement for Democratic Change (MDC) and civic movements. The politics of the land reform process unleashed many questions around citizenship, belonging, and assertions of identity. Mugabe’s often valid critique of imperialist duplicity was accompanied by an unacceptable authoritarian intolerance of dissent within Zimbabwe. The armed forces were central to his stay in power. The push in his final years to have his wife Grace succeed him heralded a longer term reign for a Mugabe dynasty. To further his wife’s ambitions, Mugabe first moved against Vice President Joyce Mujuru, the favoured contender to succeed him, in 2014. Next, the Mugabes, with the support of a faction of Zanu-PF known as the G40 group, took on another potential successor, Vice President Mnangagwa. He was dismissed from his state and party positions in early November 2017. This set off a dramatic series of events. In mid- November 2017, following military chief Constantine Chiwenga’s warning of “counter-revolutionaries” in the ruling party, the armed forces effectively took power away from the executive. This was followed by the initiation of an impeachment process against Mugabe. But, on the day the process began, in November 2017, he resigned. For many Zimbabweans Mugabe remains a contested figure. For those who lived through the humiliations of settler colonialism, his strident critique of its legacies still ring true. But others will find it impossible to accept his exclusivist assertions of national belonging and authoritarian intolerance of dissent. When combined with the deep economic crisis over which he presided, it is little surprise that the end of Mugabe’s rule was greeted with such momentous national celebration.